The TH8 hybrid DVR, a new addition to Seon’s TH Series hybrid high-definition (HD) video surveillance line, can provide full coverage inside and outside the vehicle. It offers up to eight HD 1080p camera views with video recording at 30 frames per second on all channels simultaneously. The TH8 is designed to support any combination of standard resolution analog or HD cameras, for a total of eight video and audio channels. Hybrid support allows a selection of a variety of camera options, including the HD3 series of 1080p resolution interior dome and exterior wedge cameras. 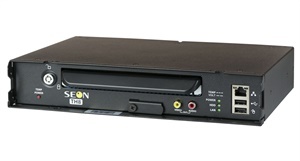 Up to 2 terabytes of storage capacity has been added to provide maximum video retention time, according to Seon.